100% Mineral Face Sunscreen SPF 45. 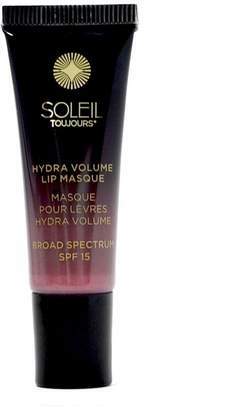 Soleil Toujours 100% Mineral Face Sunscreen SPF 45. 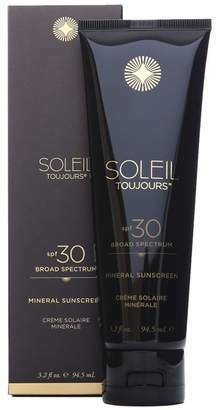 Soleil Toujours 100% Mineral Face Sunscreen SPF 45. Protect your skin's youthful vitality with the Soleil Toujours 100% Mineral Face Sunscreen SPF 45. Formulated specifically for the face, this all-mineral sunscreen provides superior SPF defense against intense sun exposure. Titanium Dioxide and Zinc Oxide provide natural protection from the full spectrum of UVA and UVB rays that cause long-term cell damage. Fortified with potent antioxidants, peptides, vitamins, and botanicals, it moisturizes, nourishes, and corrects the skin while offering incredible protection.. Includes the brand's proprietary EcoSunComplex - a powerful combination of Red Algae, Vitamin C Ester, Vitamin E and Bisabolol to help prevent loss of elasticity. No nanoparticles, hypoallergenic, vegan and gluten-free. Free of parabens, oxybenzone, retinyl palmitate, petrolatum, phthalates, sodium laurel sulfates, propylene glycol, animal ingredients or testing, and synthetic fragrances or colors. 1.35 fl oz. Apply liberally 15 minutes before sun exposure. Reapply immediately after swimming, sweating or towel drying or at least every 2 hours. Use a water resistant sunscreen if swimming or sweating. STOU-WU11. 867944000028.